Entourage is a Macintosh email client included with Microsoft Office for OS X. These instructions explain how to setup Entourage to check your email and to make corrections to your email settings if that becomes necessary. When you run Entourage for the first time, it will ask for some initial information. Entourage will ask if you want it to be your default mail client. If you plan on using Entourage for all of your email, click on the Yes button. Enter your name into the First name and Last name boxes. Click the forward arrow in the bottom-right corner of the screen (next to the number "1") to continue. Fill out the Home address information (this is optional). Click the forward arrow to continue. Fill out the Work address information (this is optional). Click the forward arrow to continue. Click on the dot next to "I want to start using Entourage without importing anything". Click the forward arrow to continue. You can optionally turn on the Enable Junk Mail filter. This is slightly redundant as SkilTech provides its own spam filtering. Once you've completed this portion of the setup wizard, continue by following from Step 1 of the Entering your email settings instructions below. When the Accounts window opens, click the New button in the upper-left corner of the window to start the Account Setup Assistant. Select the button Configure account manually. The New Account box appears. Select either POP for your server type. Click OK.
Click on the Click here for advanced sending options button. Check the SMTP server requires authentication box and close by clicking on the small square in the upper left-hand corner. Click OK. When the Accounts window opens click once on the account you want to edit so that it becomes highlighted, then click the Edit button at the top of the Accounts window. DO NOT click the Edit menu at the very top of the screen. The first tab of the Edit Account window is called Account Settings and is the same for both POP and IMAP mailboxes. IMAP mailboxes will have a total of three tabs while POP mail boxes will only have two tabs (as shown on the right). POP: POP mailboxes will have an Account Settings tab and an Options tab (as shown on the right). The Options tab contains settings for leaving copies of messages on the server as well as setting a mail signature. 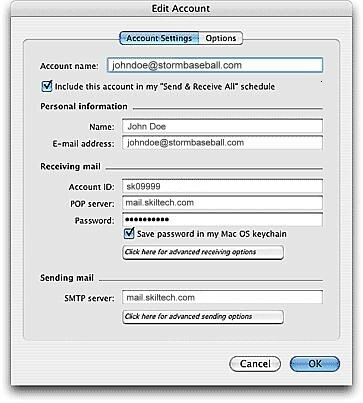 IMAP: IMAP mailboxes will have an Advanced tab in addition to the Account Settings and Options tabs. The Advanced tab contains IMAP-related settings such as purging and message deletion.